The 67th World Science Fiction Convention (Worldcon), also known as Anticipation, was hosted in Montréal, Québec, Canada, on 6–10 August 2009, at the Palais des congrès de Montréal. The organising committee was co-chaired by René Walling and Robbie Bourget. Julie Czerneda was Master of Ceremonies. Anticipation was the fifth Worldcon to be held in Canada and the first one to be held in an officially French-speaking city. Anticipation also incorporated the annual Canvention, including the presentation of the Prix Aurora Awards. 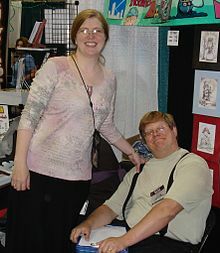 Anticipation was the first Worldcon to include a category for graphic story on the Hugo ballot. The category filled with six nominations due to a tie for fifth place. The 2009 Hugo Award statue base was designed by Seattle-based artist Dave Howell. Hugo Winners Kaja and Phil Foglio at Gen Con Indy 2007. A number of notable science fiction and fantasy awards were presented at Anticipation. The Prix Aurora Awards are given out annually for the best Canadian science fiction and fantasy literary works, artworks, and fan activities from that year, and are awarded in both English and French. The Sidewise Award for Alternate History recognizes the best alternate history stories and novels of the year. Short form: Mary Rosenblum, "Sacrifice"
The members of Anticipation selected Reno, Nevada, as the host city for the 69th World Science Fiction Convention, Renovation, to be held in 2011, and Raleigh, North Carolina, as the host city for the 10th North American Science Fiction Convention (NASFiC), ReConStruction, to be held in 2010, in uncontested elections. The Canadian Science Fiction and Fantasy Association selected Winnipeg, Manitoba, as the location of Canvention 2010 and the 30th Prix Aurora Awards. ^ "Alien-loving humans invade Montreal!". CTV Montreal. 9 August 2009. Retrieved 8 September 2009. ^ Flood, Alison (11 August 2009). "Neil Gaiman wins Hugo award". The Guardian. UK. Retrieved 8 September 2009. ^ Lalumière, Claude (8 August 2009). "People at Anticipation". The Montreal Gazette. Archived from the original on 18 January 2013. Retrieved 8 September 2009. ^ Surridge, Matthew (31 July 2009). "Anticipating Gaiman: science fiction fans to gather in Montreal for Worldcon". The Montreal Gazette. Archived from the original on 17 September 2009. Retrieved 31 December 2015. ^ Murphy, Jessica (8 August 2009). "Canadian science fiction writers taking their place on the world stage". The Canadian Press. Retrieved 3 March 2011. ^ "Hugo Award FAQ". The Hugo Awards. World Science Fiction Society. Retrieved 11 November 2018. ^ Thill, Scott (10 August 2009). "2009 Hugo Awards Honor Gaiman, Dr. Horrible, More". Wired. Retrieved 8 September 2009. ^ Lalumière, Claude (10 August 2009). "The Hugo Awards". The Montreal Gazette. Archived from the original on 13 August 2009. Retrieved 8 September 2009. ^ Glyer, Mike (31 July 2009). "Anticipation's Cavalcade of Awards". File 770. Retrieved 30 August 2012. ^ Lalumière, Claude (8 August 2009). "Anticipation, day 2: From editors to Auroras and beyond". The Montreal Gazette. Archived from the original on 18 January 2013. Retrieved 8 September 2009. ^ Silver, Steven H (11 August 2009). "Worldcon 2009, NASFiC 2010, Worldcon 2011". SF Site. Retrieved 30 July 2012. This page was last edited on 27 January 2019, at 01:59 (UTC).